Ok, so after vowing not to do the Tough Mudder (see my previous blog) I somehow on Friday evening (after a glass or two of cider) agree to enter! Much to the amazement of Dave and Ben – my thoughts were if I’m going to train I might as well finish it properly and I’m guessing a bit of bravado from the cider ! Anyway little did I know what I was letting myself in for …. 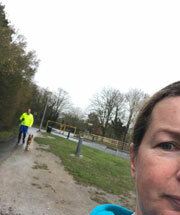 Sunday, yes in the rain and snow we ran 2 miles (That’s me with my husband behind me :-)) now this is a big achievement for me as I’ve never managed to get past week 1 of 0-5k couch potato before – what was even more impressive was I ran nearly all the way with the help of my trusty running dog Gnasher ( I have to admit she was a great help in keeping me going ). I warmed down correctly or so I thought and although a little achey felt pretty good. Fast forward to the next day and I had my first experience of DOMS which to be honest I’d never heard of before . 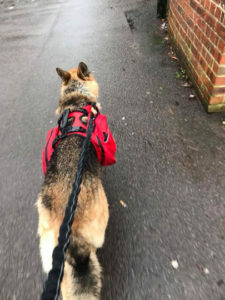 I now know it stands for delayed onset muscle soreness- in the morning I felt walking downstairs was a bit sore but I noticed as long as I kept moving I was ok – worked all day and then off I went to bring the horses in stiffened up a bit in the car but managed to walk it off again . Little did I know what was to come ….. sat down and ate tea and then tried to get up from the kitchen table and I had completely seized up in my legs they just didn’t want to work and if I tried to make them it was very very painful. I hobbled to the sofa where I remained for most of the night I even contemplated sleeping down there as the thought of stairs scared me ! Anyway good old google informed me I was suffering from DOMS and faithfully promised I’d be ok within 24-48hrs ! Oh joy I was supposed to be running another 2 miles the next day . Admittedly I was feeling slightly less sore on waking and as the day went on I was feeling like I could run again so I’m off to give it a try ….. I will keep you updated on how the training is going and share some photos on our Facebook page.